GreenBuild 2011. TREEHUGGER ON LINE PUBLICATION FEATURED TERMOBUILD AS BEST BUILDING TECHNOLOGY OF THE FUTURE. 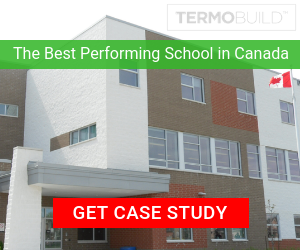 This clever system by Termobuild connects ducts to the empty voids in precast hollow core slabs -- it uses the thermal mass of the slabs to store or absorb heat. "Surplus heat, generated from body heat, lighting, computers, sun radiation, etc, can be stored in the slabs increasing their temperature by 3 to 6 Degrees Fahrenheit during the day without affecting the comfort of the occupants. "In the summer this excess heat is dissipated from the slabs by cooling the slabs with cool night air in temperate climates, or using conventional chillers, but with up to a 50% reduction in capacity when compared to conventional technologies, in hot climates. During the winter, in cold climates, we retain the heat stored in the slabs overnight, to maintain comfortable internal conditions for the occupants the next day. In some hot climates, just using the cool night air, without the need for chillers, can cool the structure to provide comfortable conditions by the following morning." I first saw this at Kleinfeldt Mychajlowycz Architects' Fire and Emergency Services Training Institute Building at Toronto's Pearson Airport; now it is being used on much bigger structures. I love the way it eliminates ductwork and utilizes the cores of the slabs.